When it comes to making design statements at home, most things worth doing are worth overdoing. That’s how we feel about large indoor plants: More is definitely better, not only because of the endless styling options they bring to the table but also in terms of the many health benefits they offer. A study published in the Journal of Environmental Psychology found that people who work in an office setting with plants and windows have a higher capacity for attention compared to those without access to nature. Houseplants are also linked to overall health improvements since they absorb indoor pollutants. And as much as we love a splash of nature à la terrariums, small succulent gardens, and tabletop flower arrangements, large indoor plants and trees can add so much more floor-to-ceiling style to any space, sprucing up neutrals with lush, green color. The natural texture and height that large indoor plants bring to a room make them our new favorite way to bring the outdoors in. Scroll through the seven indoor tree ideas below so you can start brainstorming ways to style your own. These glossy planters in a creamy, honeysuckle-tinged white and blue-tinted ash offer just the right touch of personality. Why not maximize high ceilings and exposed beams with a giant tree that stretches skyward? The height of the tree draws the eye upward to showcase the architectural lines of the lofted ceilings. The shades of cream and natural wood finishes in this living room help accentuate the perfect green floor-to-ceiling centerpiece (even if it is tucked away in a corner). We also love that it's right by the side door entrance to the yard. As you enter the room, the leaves ease the transition by bringing the outdoors inside, which also play off the sun-faded neutral color palette. A goldfish planter is perfect for both traditional and eclectic spaces—it can either bring in a quirky element or dress things up depending on how you style it and what you pair it with. 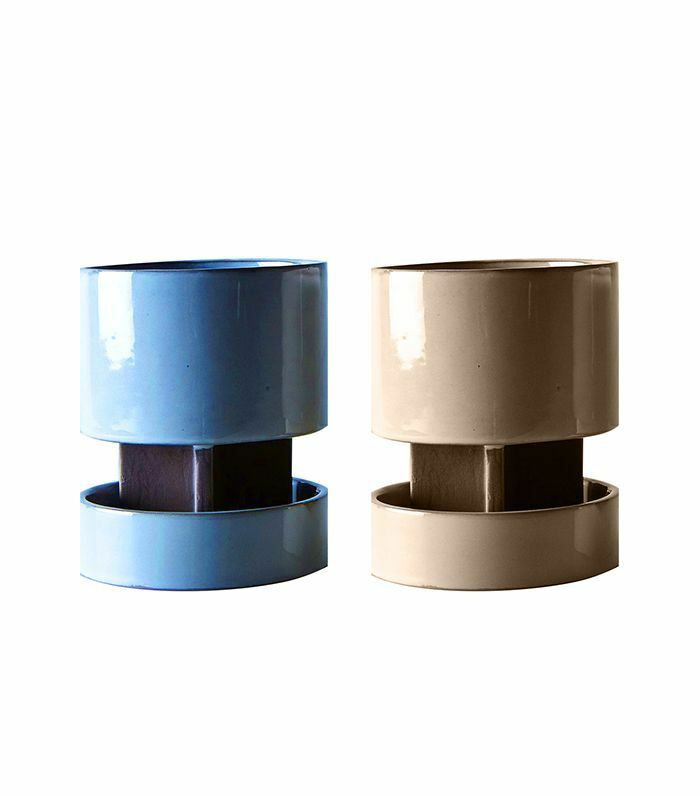 However you choose to use it, this planter will make an artful pop of color. The white ceramic planter seamlessly complements the white walls as to not create too many color contrasts. It brings the natural wood features in the room to new heights while also introducing a casual, natural touch to compliment the sleek, sophisticated décor and bold pops of color. With calming, neutral colors and an eye-catching gloss finish, these two matching planters are the perfect pedestal for your favorite indoor plants. We love absolutely everything about this bathroom. From the Victorian footed bathtub to the coastal vibes of the area rug and the clean white tiles. But the real statement is the proportion of the tree. Almost overgrown as it snakes toward the ceiling with uneven branches, this indoor tree is an unexpected touch of nature in a cool, minimal space. As you close your eyes and relax in a bubble bath after a long day, you almost forget you're even indoors at all. 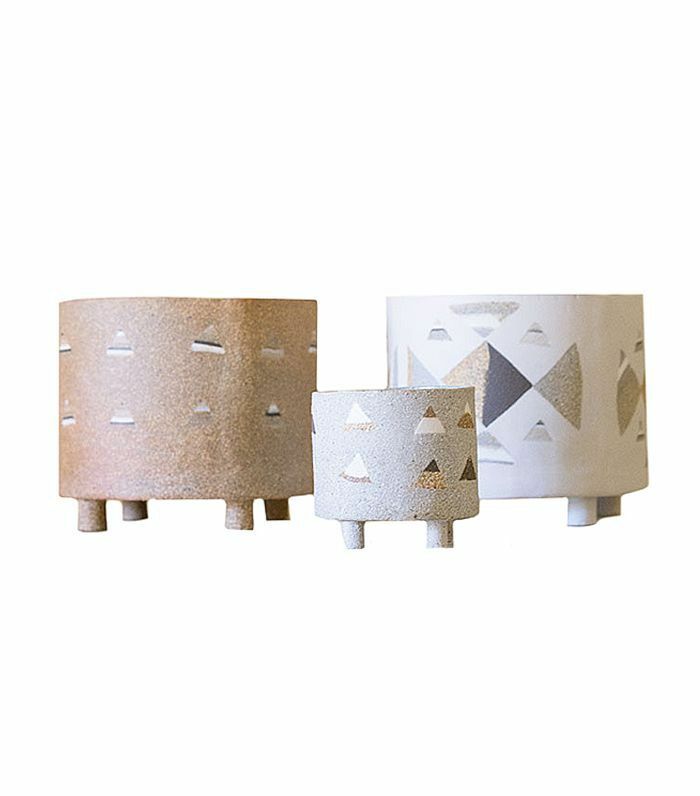 These ceramic planters with charming geometric patterns on them boast a very California-cool vibe, so it's not surprising that they're handmade in Los Angeles. Use these for an even more organic look. A large indoor plant can really help split an open layout into two spaces. In this case, the living room and dining room blend into one another while the more casual kitchen is somewhat separated by the citrus tree. Its bulbous shape also adds instant personality to the room, creating movement from floor to ceiling. When selecting the right tall tree for your home, opt for one that suits your signature style. This one is unique yet timeless and chic yet understated, just like the room it lives in. 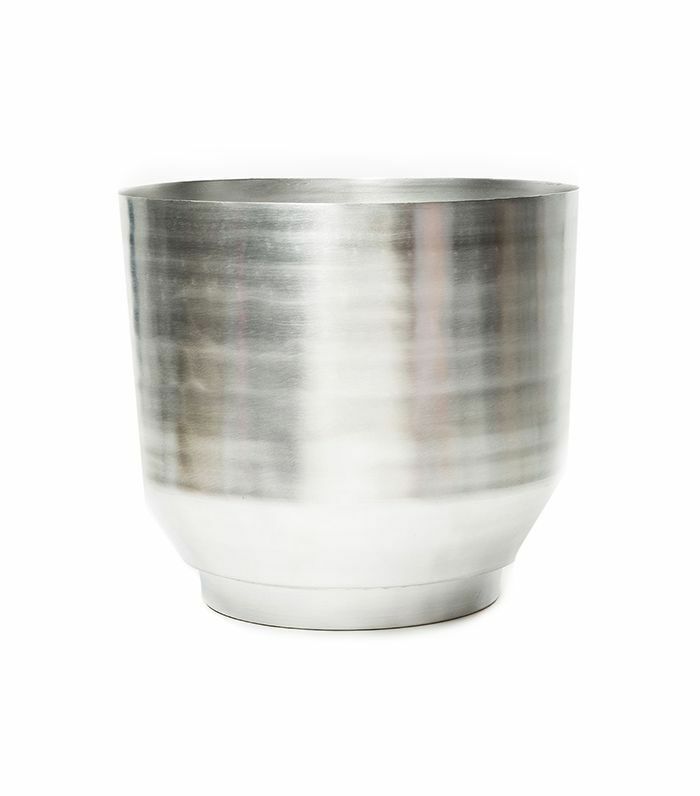 A metallic planter makes a tall tree shine in a simple, minimal space or stand out in a crowd of eclectic furniture and bright colors. To create the illusion of a large tree with a slightly smaller alternative (or one that's still in the growth phase), make sure nothing else in the room surpasses its height. As you can see in this dining room, the lamp on the console table is just as tall as the plant. This metallic emerald lamp also does a stylish job of reflecting the natural beauty of the tree across the room. In a similar fashion, the indoor tree creates a juxtaposition of natural, earthy vibes, modern metallics, and luxe velvet and marble. 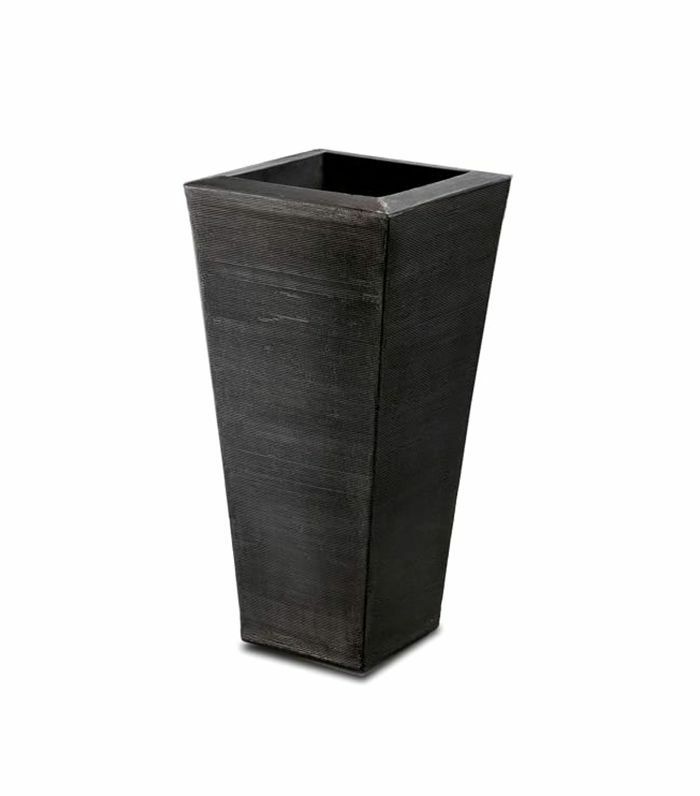 With straight edges and carved surfaces, this planter's understated, textured look is perfect both indoors and out. It'll work in pretty much any environment in that it can withstand weather conditions but also works inside, and it's super versatile, so it'll blend in with any style. Greenery adds color and life to any space, serving as the perfect accent to the room in the house that probably needs the most livening up: the office. While the area rug, fireplace, desk, and moody green walls feel like a traditional and stately study, the indoor plant makes the environment a bit more casual and comfortable. This balance is perfect for boosting productivity and reminding you that even though you're there to work, you can still let the creativity flow. This black steel tripod stand with a white fiberglass bowl highlights the plant's beauty and boasts a unique mix of elegance and laid-back ease. Greenery is a chic complement to the shades of cool gray in the abstract painting above the sofa. And despite the room's many intriguing textures, vivid color palette, and eclectic mix of styles, this large tree holds its own. The scale variation feels perfectly balanced, from the tree to the large-scale wall art to the smaller decorative pieces and floor-to-ceiling windows. This gold metal planter is a stylish statement that will balance out the rustic, natural feel of a large plant with its spunky gold finish. The black four-leg stand adds a delicate touch so that it doesn't look overly bulky. Subscribe to our newsletter for more interior design inspiration and ideas.